This was a great hit as a Christmas present this year! This was adored by all who saw it. I also got the two glasses. A great addition to a wine lover I know. My daugther loves. All of it. We put it in our dinning room. It all looks great on the wall. I would tell my friends to buy the set. Looks just as pretty as the picture did. This clock is pretty and keeps good time as well. Yes I would I love it. Nice looking clock, however smaller than I thought. Thought this was sooo pretty. I ordered it but unfortunately the glass from the clock was scratched up and so where the wine goblets. Am returning it. I ordered another set of the same but again the clock glass was all scratched up again. It;s a shame that this glass gets scratched up in shipment. I guess the plastic on the clock must be pretty cheap for it to scratch so easily. This was suppose to be a gift for my daughter's kitchen and Im disappointed that i can't give it to her. They have to go back and i am not buying it again because i will probably have the same issue. what a shame. wanted new clock and my kitchen decor is wine and grapes. Love the look. Appears to be made very well. Re-doing kitchen in a wine theme, this will be perfect above the chalk board. It will look beautiful in our kitchen. I love wine tasting events and wine. I decided to decorate my kitchen with a wine clock. It's unique too. I need a clock in my dining room over my wine rack. 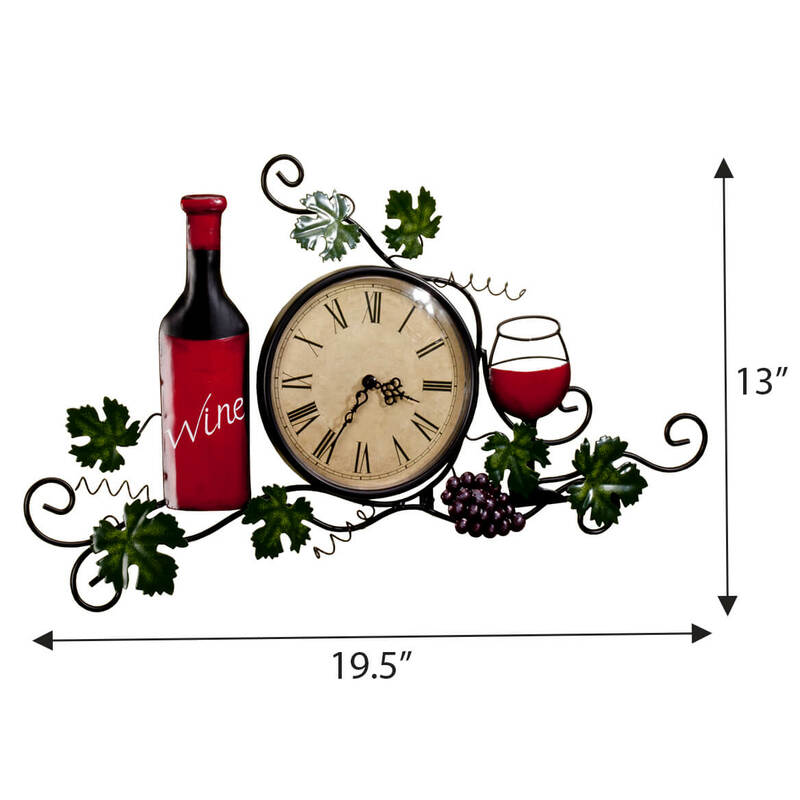 I was looking for a new kitchen clock and I am doing it over with a wine theme. This is exactly what I have been looking for! Redecorating with a wine theme. It looks very nice, but the quality of some items from MK is not as good as other sites; LTD Commodieds, for example. Daughter in law loves wine! thought she'd enjoy this clock! 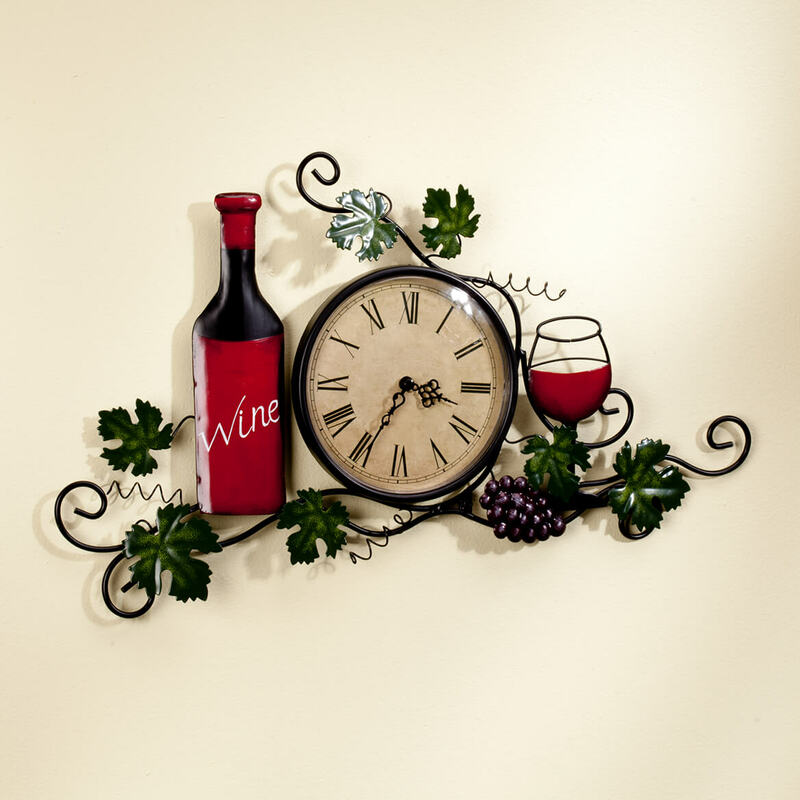 I wanted a new clock for my kitchen and this looked nice, I also bought the wine glasses that go with it. 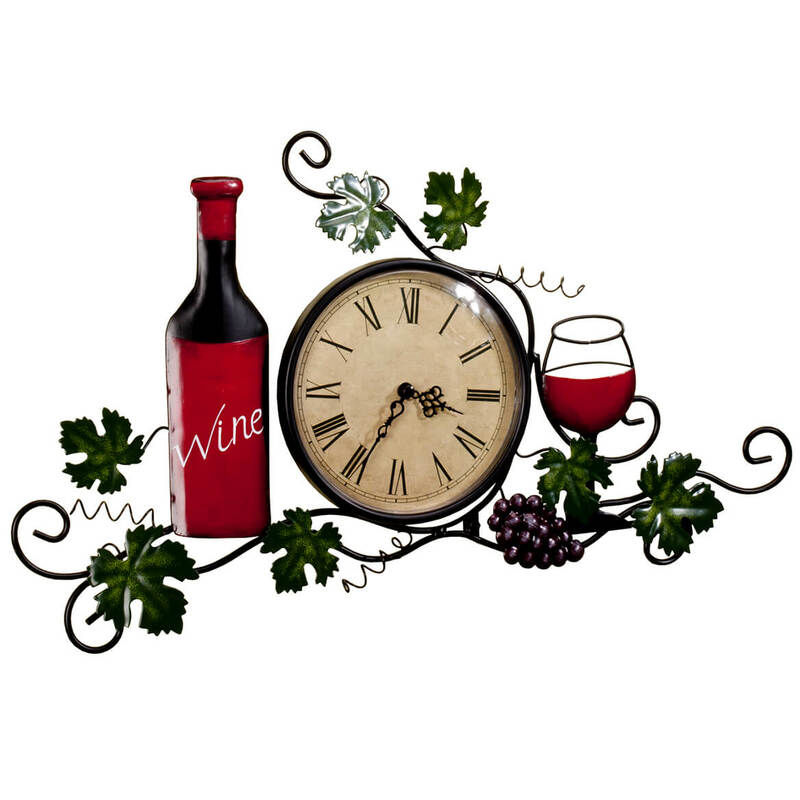 I just redecorated my kitchen in a wine motif and the clock will look great in there!! Matches my décor. Hope it is good quality. This item enhances the theme of my kitchen. I'm decorating my kitchen in wine theme. My daughter new house. It’s in the kitchen. I HAVE BEEN LOOKING FOR A FOCAL POINT FOR MY KITCHEN WHICH WAS RECENTLY REPAINTED. I THINK THIS WILL MAKE A GREAT CONVERSATION PIECE FOR THE ROOM. 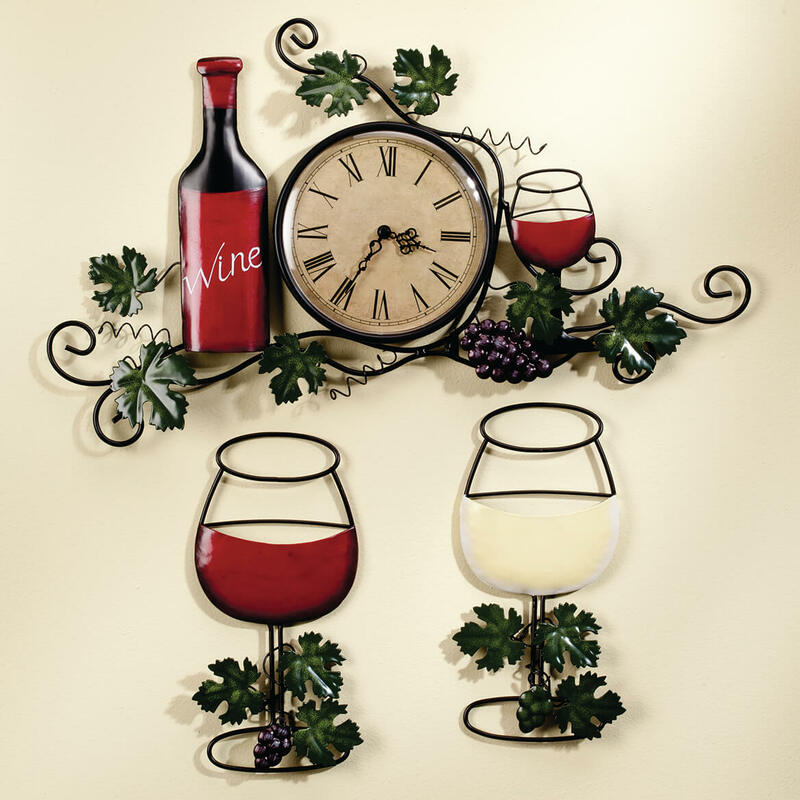 Great way to tell time and enjoy the display of wine! a beauty of a clock ive checked other websites and they had nothing compared for the price and look. cant wait to receive my order. BEST ANSWER: I BOUGHT THIS AWILE AGO FOR MY DAUGHTER FOR HER KITCHEN. ALL IS I CAN SAY IT IS A PERFECT SIZE! NOT TO BIG, NOT TO SMALL. IF YOU LIKE IT,BUY IT! I DONT KNOW THE EXACT DIMENSIONS, IF THAT IS WHAT YOU ARE WANTING TO KNOW! I AM SORRY......BUT I GAVE YOU A HONEST ANSWER! Thank you for your question. It is 20"Lx12"H with 6 1/4"dia. clock face. We hope this information will be of help to you. It is 12 1/2" tall and 28 1/2" wide. I love mine. I also bought the 2 wine glasses to go with it. BEST ANSWER: Thank you for your question. It is 20"Lx12"H with 6 1/4"dia. clock face. We hope this information will be of help to you. Is the face of the clock glass or plastic? Also does the glass and wine bottle go with the clock?